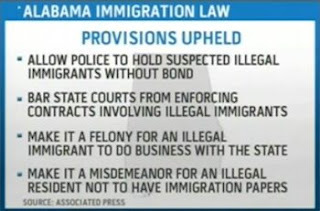 Notice the key word "Illegal" denoting not racial profiling but law abiding. First off, let me just come right out and say that I am in complete agreement with these new requirements the state put on illegal immigrants. Let me repeat that last part where I wrote illegal immigrants. That being said, if you're still here reading this, I would like to add that I'm not so sure I agree with the sudden implementation of the law. There are many folks in the political arena nowadays trying desperately to demonize the effort of individual states to protect their assets and economy by restricting benefits to those legal citizens living within their borders. We, as a nation, should have been thinking about this a long time ago. Fear mongers will have us all believe that these immigration laws are just gateways to harsher actions like pulling families apart, taking children from their parents, racial profiling, and discrimination. But we must remember one very important thing, the law confines these restrictions only upon illegal immigrants. Those are immigrants to the United States that are not citizens, and do not pay taxes. Sure, until now, these illegal immigrants were still entitled to benefits paid for through the taxes of our countries legal citizens. I for one, am having a tough enough time just getting by without having to pay for services I cannot qualify for. I understand completely, the economic and political reasons people try so hard to get into the United States-legal or not-but I also believe we have many people here now that should be helped before someone who's already demonstrated a lack of respect for our laws. Educators and school administrators are concerned that public school attendance will drop drastically by this new law. They are concerned that they will be made to become immigration law enforcers. To that I say, not really. The children of legal citizens within most states have always been required to provide records of birth and immunization in order to register their children for public school. Sounds good to me. Isn't it natural for parents to want to be assured that their children will not be unduly exposed to diseases from others while attending school? Well guess what, this new law finally, and for the first time, requires that same information from children of illegal immigrants as well. Yes Virginia, this is a first. In the past, these children were allowed to be enrolled in, and attend public school without providing this information. By the way, children of US citizens stood the chance of not being allowed to stay in school if they could not provide this information. So, educators are not going to become the next group of INS enforcers, they simply don't have the time for that. They are simply being asked to verify the same information for all children, not just some. Although I agree with the context of the law, I am saddened at the way it has been implemented. I feel that forcing immediate compliance in this law will put an economic burden on much of Alabama. Many farmers currently rely on seasonal workers in order to harvest crops. A small percentage of Alabama's economy relies on its many poultry processing plants (a dirty little secret) and these industries will likely suffer as prospective employees move on to other states with less stringent immigration policies. But let's think about how we got here, and how we can move on. Truth is, we brought this upon ourselves. I was a business major, have an MBA and know just a little (very little) about business and economics. I do know about supply and demand, and profit margins. You see, as our economy slowed (many years ago) the government found ways to provide for those in need. We expounded upon the original unemployment and welfare programs (originally formed during the great depression) making them "better" to the point that the programs could sustain those in need and, in some cases, even surpass what they could expect to earn doing seasonal, unskilled, or otherwise, non permanent work. Many agricultural businesses operating under a very thin margin could simply not afford to pay these new wages. In other words, they could not compete with our welfare system. Well, one truth in business is that, where there is a demand, there will eventually be a supply to fulfill that demand. This is where illegal immigrants come into the picture. As people holding no citizenship and working under the table, the business could benefit form their work and not have to pay for all the things that citizens are entitled to. Now that illegal immigrants are fleeing the state en masse, where can businesses, historically working within very small margins, find employees willing to work for such small wages? Unfortunately, we've created a nation of entitlement, and those currently reaping the benefits of our social programs are unwilling to fill this void. Here's a novel idea. Why not offer those that have been on unemployment, or welfare, to fill these positions? Why not provide work for the unemployed, even if it is only seasonal. They could have the option to go right back on unemployment when the season is over. And even better than this, why not threaten to cut unemployment and/or welfare benefits for those refusing to take such a job? Now, we must also find ways to streamline our immigration process. Okay, I must apologize for such a long rant but I'm a simple man, and sometimes I find it difficult to understand why we, as Americans, cannot embrace simple solutions. We tried this before with Welfare to Work, but I think you're on the right track Jim. Now if Big Business will agree and give equal pay, our country might have a chance. Meanwhile we'll keep Occupying Wall Street and the other cities until Big Business heeds our cry. The Welfare to Work program is still in place, but only if you are applicable for TANF (family assistance), which is quite a hard program to qualify for. And, I heard around that some of the local chicken plants fired almost every single immigrant who could not provide legal papers after this law was put in place, and they are starting to hurt bad because of it!